This being on our plate, I think it is best that we establish and look at the rhetorical situation we have at hand before us. McCloud notes that the progression of history and development of writing created differences in these two forms of communication. These notions of “received” and “perceived” conceptions are part of what pushed their place as communication apart over time. McCloud ends up helping to define this difference more by placing the conceptions along a plane and gives images to help illustrate the variances. What our culture is returning to is perhaps very much a healing of the divide between art and literature. At the same time, McCloud’s method of communication is operating as an example of his own theory: a graphic narrative talking about graphic narratives/comics. McCloud is not alone in his assertions that imagery and words can work together, or that they are able to tap into something embedded in humanity. 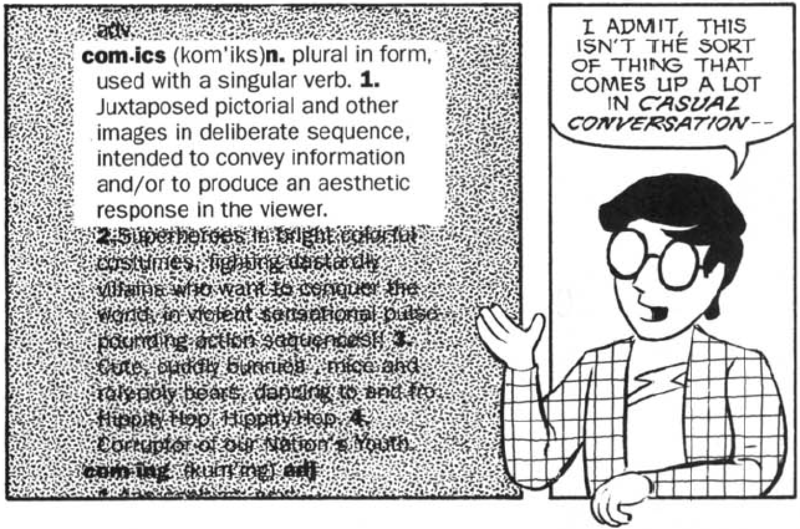 Famous cartoonist and comic book pioneer Will Eisner, not unlike Scott McCloud (who actually builds on Eisner’s work), in his book Comics and Sequential Art, points out that imagery, like written language, serves and acts as a communicator. Eisner notes that “Comprehension of an image requires a commonality of experience . . . the success or failure of this method of communicating depends upon the ease with which the reader recognizes the meaning and emotional impact of the image” (7-8). So, when one is shown or presented with imagery that is familiar and recognizable, one can and will best be able to assimilate the message being communicated to you. Beyond the need for comprehension, it is needed that one be able to specifically recognize the power of visual or graphic narratives as well. The power of those visual images relies heavily within the folds of collective values and recognizable concepts. Chaim Perelman and L. Olbrechts-Tyteca, in their work The New Rhetoric, identify that when looking for objects of agreement, values fall within a second grouping, “concerning the preferable, comprising values, hierarchies, and lines of argument relating to the preferable” (66). These ideas are ones that foster agreement within their conception of a “universal audience,” one that is unknown. Expanding on how values work, they note that “Agreement with regard to a value means an admission that an object, a being, or an ideal must have a specific influence on action and on disposition toward action and that one can make use of this influence in an argument” (74). So, we know that images need to be agreed upon and recognizable in order to communicate. Good. How about the fact that certain images, and this is with us trying not to jump off into semiotic theory, appear to have a certain power inherently in them. that images on the page are a result of author intention . 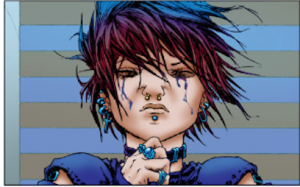 . . that the meaning you desire from a comic book or graphic novel might coincide with the meaning of the author . . . that images can function to show the reader the story or tell the reader about the story [and] images are an important agency . . . for conveying subtext, the underlying meaning of a story. (44-6). 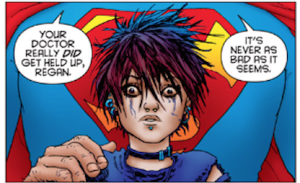 Duncan’s notions here, his terminology regarding rhetorical intent found in images, of meaning and interpretation, parallels closely with what Duncan, in collaboration with Matthew J. Smith attempted in their work The Power of Comics. In this work, under their chapter about creating a story, note that there is a “Process of Encapsulation” when comes to making comic books. They specifically focus on two approaches, choices: syntagmatic and paradigmatic choice. Syntagmatic choice is defined as, “the process of selecting which panels to present from the possible progression of story images that could occur [it] is analogous to selecting the word order to create a sentence” (132). Whatever is represented, regardless of a reader/viewers preference, this choice allows for greater “dramatic emphasis” to be pulled from what appears on the page rather than what is left out (132). With the paradigmatic choice, “the chosen images and all the images that could have made sense or communicated nearly the same meaning at the same point in the panel”, which illustrates a more open, semiotic approach to how image selection as stylistic choice can work within a comic book narrative (133). This choice, the paradigmatic one, remains open to symbolic interpretations, which in turn, according to Duncan and Smith give rise to the use of economy of expression via rhetorical figures such as: synecdoche, metonymy, and sequence metaphors (133-4). So, images can have fixed and flexible meanings when used? Good to know. Well, perhaps we need to see the use of these rhetorical figures in action. Let’s do this by looking at an example I know well. 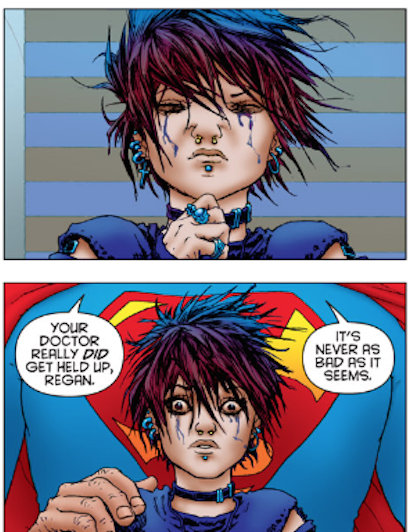 So, anyone who knows me a bit, or has read back posts in my blog about my dissertation process, knows that I am a fan of Superman. 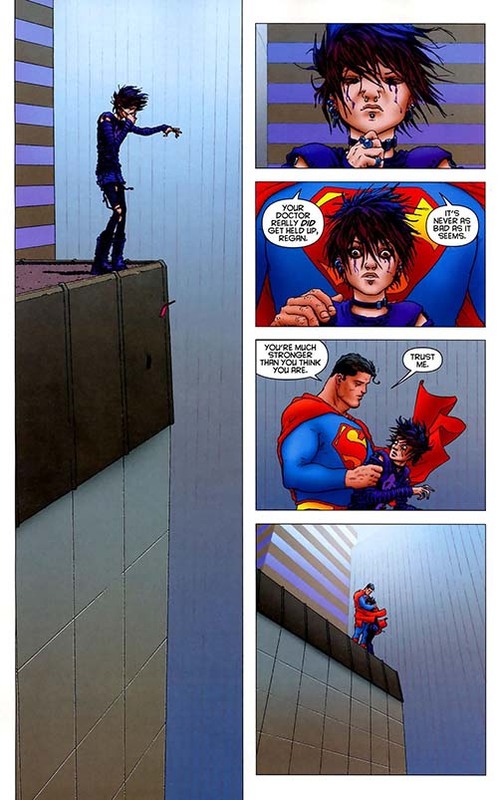 I only really became a fan of Superman after I read Grant Morrison and Frank Quietly’s All-Star Superman. What we have here is 1 page, 5 panel layout. Panel 1 runs the length of the page on the left hand side, helping to indicate height and placement of the scene, the subsequent 4 panels (panels 2-5) run down the right hand side. These panels are where we will apply and look at the use of our rhetorical figures. On the right hand side, running parallel, down the page, are 4 panels opposite this long opening panel (seen in full page example above). This plays out in the first panel shows a close up depiction of a young girl, apparently in distress. Though you have seen her whole body in the first, left hand panel (long shot with building included), you can infer that her entire body has become clinched together in some anxiety before what very well be the prelude to a leap from this building by the way that her hands are clasped tightly and her eyes are shut, with her shoulder hunched up. 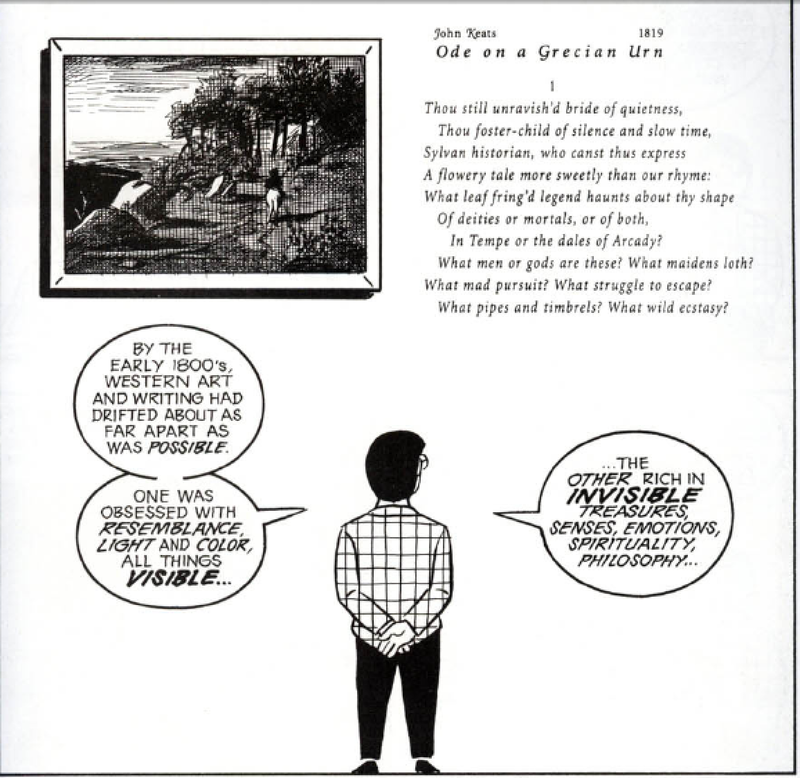 Here the figure of synecdoche is working within another, as McCloud defines it, picture specific panel (Understanding Comics 153). There are no words. All information must be inferred via body language and previous knowledge stemming from the elongated panel to far left of the full page image. One does not have to see the rest of her to infer the notion that she is in pain and distress, though the specific reason remains unknown. 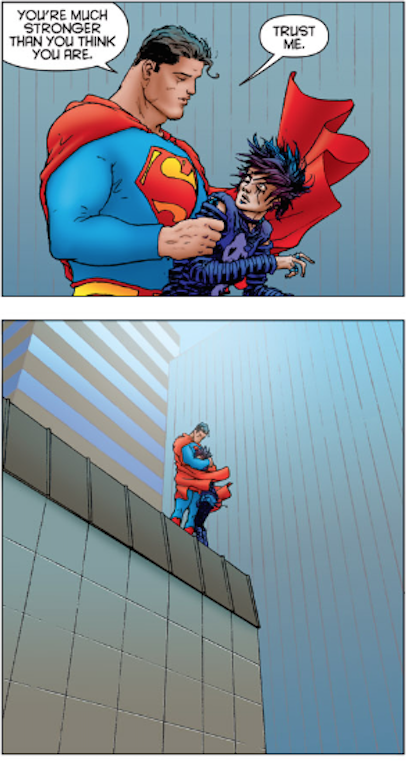 The next sequential panel below it again utilizes synecdoche, but this time with the focus being drawn to the chest emblem of Superman, his “S” and his most identifiable feature other than his cape. The scene in this panel would fall closely into what McCloud calls an Additive type of panel (154). Here, the use of words are implemented and imposed as a way of providing amplification and elaboration for the audience’s reception and interpretation of the image. 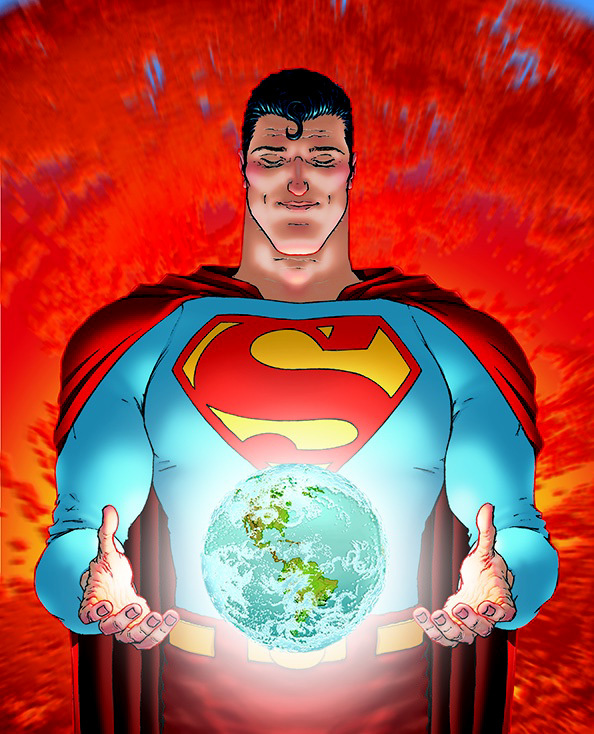 To begin to look at the potential place of images, particularly as rhetorical artifacts and with the potential for communication, I chose to come at the comic book superhero (a popular aspect of our current culture) from a non-cinematic point of view in order to, ideally, start a conversation about the potential of this kind of narrative in the classroom. This is a process that I not only advocate, but practice too. In future posts I aim to share what some of my students are doing in the Comp 2 classroom with graphic novels, as well as present some steps I am taking to apply graphic narratives as a form and medium to engage students as well. It just helps if I warm you up a bit by talking about and demonstrating the potential that is there first. Duncan, Randy. “Image Functions: Shape and Color as Hermeneutic Images in Asterios Polyp.” Critical Approaches to Comics: Theories and Method. Eds. Michael J. Smith and Randy Duncan. Florence: Routledge, 2011. Print. — and Matthew J. Smith. The Power of Comics: History, Form and Culture. New York: Continuum, 2009. Print. Liddell, H. G. and Robert Scott. English-Greek Lexicon. 9th Ed. Oxford: Clarendon Press, Print. Perseus Digital Library. Tufts University. Web. 31 July 2015. Rhetorica ad Herennium. Trans. Harry Caplan. The Rhetorical Tradition: Readings from Classical Times to the Present. 2nd edition. Ed. Patricia Bizzell and Bruce Herzberg. Boston: Bedford/St. Martin’s, 2001. 243-282. Print.